Inside this free dog training lesson, you will learn what a target / training stick, how you can condition your dog to it, and how you can use it to train your dog to do really cool tricks. Gives you the ability to get your dog into specific positions, by training him or her to follow the target at the end of the stick. Not all dogs value food, so a target stick is a great alternative to luring as you can reward your dog with toys or praise. If you have a small dog, then training your dog with a target stick can be extremely beneficial and it will definitely help your lower back! You can train all sorts of great tricks using a target stick, some of the most common ones are crawl, beg / sit pretty, stand tall and even jump! Hi Jean and thank you again for that cool session. I surely will buy one of those training stick. I have back pain and i find hard sometimes to have my dogs do low near the ground tricks. But i have short question, do you think i could be easier to have my dogs run beside my bike with a training stick instead of none. He still pull a bit on the leash sometimes when we walk. So i thought that i would be a good guiding tool. What do you think? If your dog is running beside your bike, no I would not recommend a training stick as your dog will be busy on keeping up with you and he won’t focus on the training stick. I do recommend getting an attachment that connects to your bike like the Sringer. As for walking beside you, I guess you could use it for that but I’d recommend rewarding your dog for walking to your side (while making sure you touch your hip before giving your treat to your dog). I have never heard of touching your hip before giving the treat. How exactly do you do this, with the treat in your hand, or with the other hand? What is the purpose of this action? I have been working on loose-leash with my 10 month old rescue border collie mix. We have made some improvement, but it has been 3 months and we are not where I thought we would be. 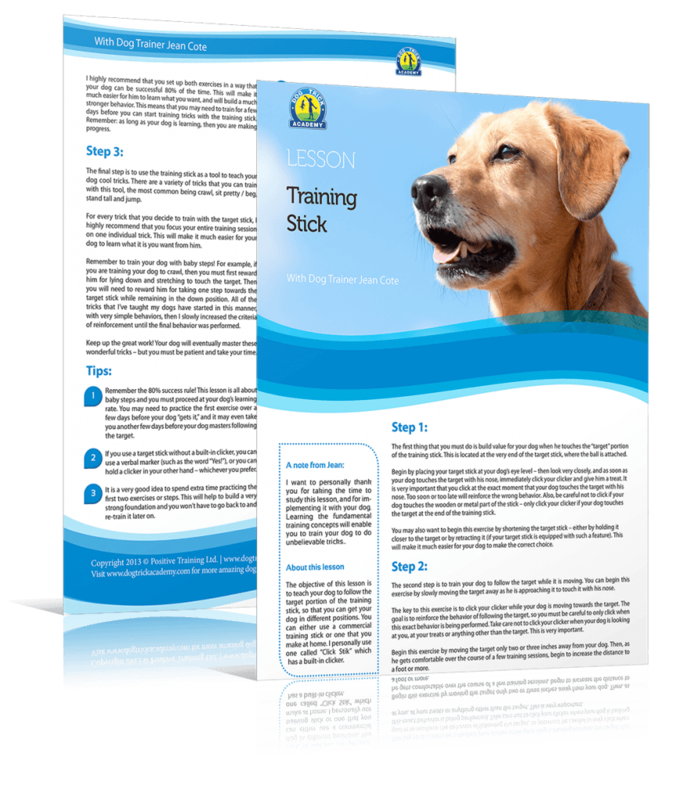 I have heard it is one of the hardest things to teach your dog, but I have been trying all the methods I have seen and so far nothing has really made it sink in for him. If your dog is on the left, you bring the treat to the side of your hip, then you give it to your dog. The purpose of this is to get your dog to stay inside your reinforcement zone. If you imagine a line going from either side, your dog should stay behind this line. What happens if you don’t do this, is your dog will eventually creep forward and then you end up giving your dog a treat when he’s in front of you. Thank you for the reply. And as for the walking, there was something i wasn’t doing correctly and it was giving the treats at the wrong place. Thanks again. I’ll try that first. Very nice video.I have a target stick but haven’t used it much.After watching this I will definitely work on a few tricks with it. Hey Jean , i wanna ask if it’s ok to use something that i used for Horse training instead of clicker , it also works with sound and the sound poduced is really similar to the clicker ! Absolutely! The clicker is only one type of markers, I often use the word “yes” to mark a behavior, so you can definitely use any other type of markers that you prefer, whether it’s a word, a whistle or even a horse training tool.